We appreciate you taking the time to tell us about your experiences with the Board of Executive Clemency. Your feedback is important to us. It will help us improve our services to the public. We greatly appreciate your time in completing this survey. 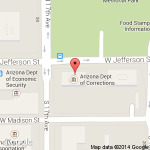 What was the reason for your contact with the Arizona Board of Executive Clemency? What hearing did you attend? If you want to bring attention to a specific hearing you attended, let us know. If applicable, how did you participate in the hearing? Did you use the Board's website to obtain information? Was the Boardroom environment comfortable? Arizona Revised Statutes requires the Board of Executive Clemency to provide victims at least 15 days notification prior to conducting a Parole, Absolute Discharge and/or Commutation of Sentence hearing. Did you receive a Board notification of the hearing at least 15 days prior to the scheduled date? Was your Telephone Notification Coordinator courteous? Was the information easy to understand and helpful in the letter? Were you assisted by the Department of Corrections' Victim Services Advocate?